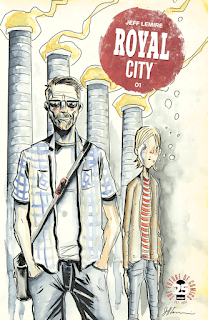 It's no real surprise for long time readers, that I'm a fan of Jeff Lemire. It may be a surprise that he's one busy dude who is writing multiple comic book series as I write this one little article. He's been very busy all over the world of comics. He writes for the big 2 here and there as well as providing Valiant Comics with some of the best superhero genre comics of modern times. Of course, he somehow manages to both writer and illustrate his creator owned comics published by Image Comics on top of it all. He must be a superhero himself. ROYAL CITY is one of those creator owned comics that is currently ongoing with Image Comics. Not to mention his latest debut series there GIDEON FALLS. Volume 2 of Royal City comes out April 18th and if you haven't been paying this series any attention, I suggest you do now. Get volume 1 just like I did and BINGE this now. I wrongly ignored this series because I was busy with all the Jeff Lemire going on everywhere all over the comic book world. So it wasn't until a week ago that I decided it was time to pay some attention to his latest creator owned series. I couldn't have been more wrong to have ignored it although, it is an amazing binge read. I can't speak to how I would feel about this series if I had read it monthly. Binge reading this had me reeling. I COULD NOT STOP READING. In fact, with issue #10 finishing in February, I'm in shock. I need more. I need it now but I don't get more until issue #11 on frick'n May 30th!!! So, why should you read ROYAL CITY? Firstly, the plot itself. This is about a family dealing with trauma and it is presented in a unique way that actually tackles how different family members deal differently with the same trauma. In this case, it is dealing with a possibly suicide. Throughout the series, the deceased person appears to each member of the family in a different way. Some family members see the deceased as they were when they died. Others imagine them as grown up who has been with them in all the absent years progressing with them as if they were alive. It's not clear right away whether they see the deceased purely in their own mind or by some supernatural intervention. It's a huge mystery and it does keep you reading. You continue to learn about each character and not only how they feel about the deceased but how they feel about each other as the history of their lives unfolds throughout the story. Of course, they are all dealing with another family member facing a death sentence. What is interesting to me about this particular Lemire book, is not only the realism of how a person's brain deals with grief, but the effect the art itself. It imparts a significant loneliness throughout the entirety of the series to date. This feels very real and you actually feel the loneliness and struggle of each character in a very emotional way without even having to consider their actions and words. You will quickly find sympathy with each of the characters despite their flaws. You will just FALL IN LOVE. So my question to you is: WHY AREN'T YOU READING ROYAL CITY? !